Scientists report on identification of clays and carbonate that formed on early Mars in a liquid water environment near a large impact basin. Coordinated analyses using multiple datasets were used to characterize the composition and stratigraphy of the region. 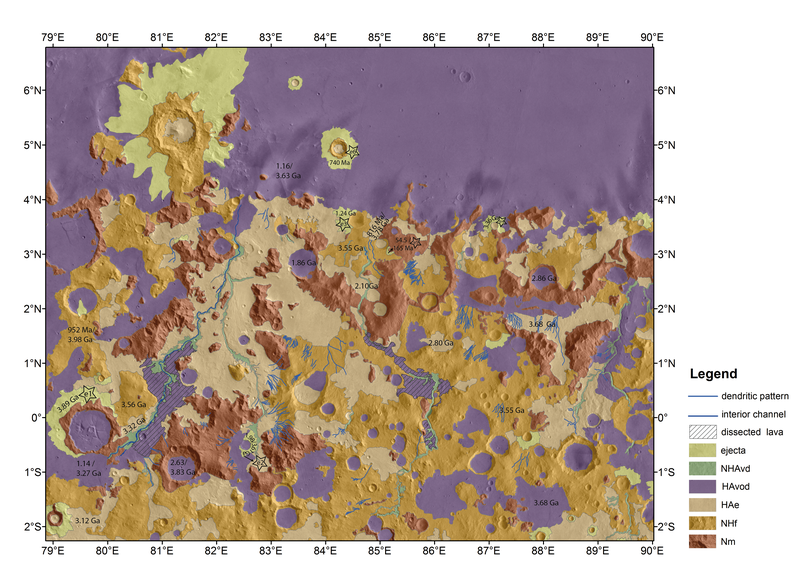 A paper published online in April 2013 in the Journal of Geophysical Research highlights new mineralogic and geologic observations at a site called Libya Montes just south of the Isidis Basin on Mars. “Liquid water is likely to have been present on the surface or subsurface of this region when the clays and carbonates formed” says Janice Bishop, SETI Institute scientist and lead author on the paper. 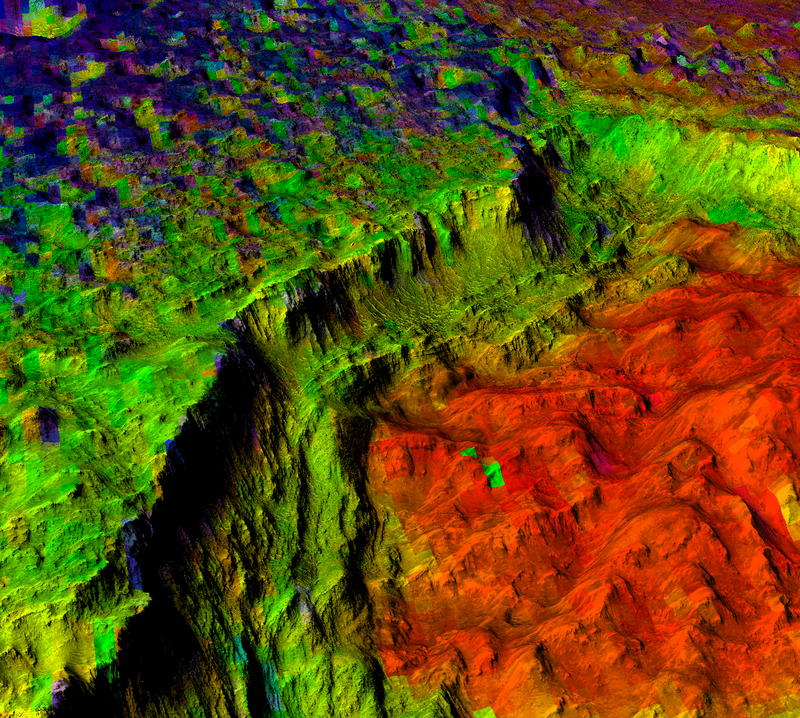 This 3D image provides a view ~40 km wide of the mountains and a valley in the Libya Montes region using a composite mosaic of MRO-CTX and MEx-HRSC overlain on a Digital Terrain Model (DTM) from HRSC and vertically enhanced by 2.5X. Co-author Daniela Tirsch of the DLR in Berlin who prepared these maps describes that “the clay units are exposed below the olivine-bearing unit at several sites where the wind abrasion has scoured the surface”. 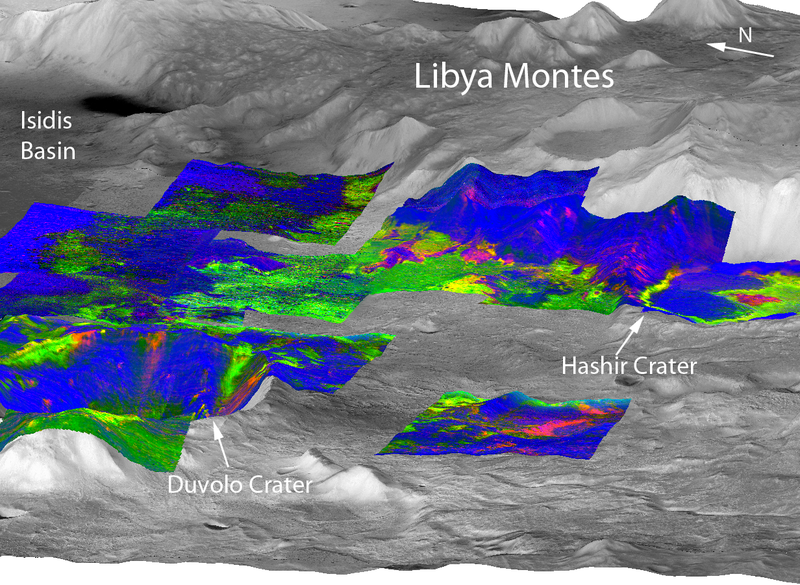 The colored sites are compositional maps from MRO-CRISM where the pyroxene-bearing basalt is mapped in blue, olivine-rich basalt is mapped in green and Fe/Mg-clays are mapped in red. This ~2 km wide portion of Hashir Crater featuring HiRISE image DT1EA_002756_1830_002822_1830_A01) with colors from CRISM image FRT000047D8 (blue is pyroxene, green is olivine, and red is Fe/Mg-clay) was overlain on a HiRISE DTM and enhanced 3X vertically. Co-author Livio Tornabene of the University of Western Ontario developed this technique “to illustrate the stratigraphy of the geologic units and view changes in the surface morphology with composition on a scale of meters rather than tens of meters”. This ~8 km wide 3D view of CRISM image FRT0000A819 shows the locations of different minerals found in the rocks at Libya Montes. 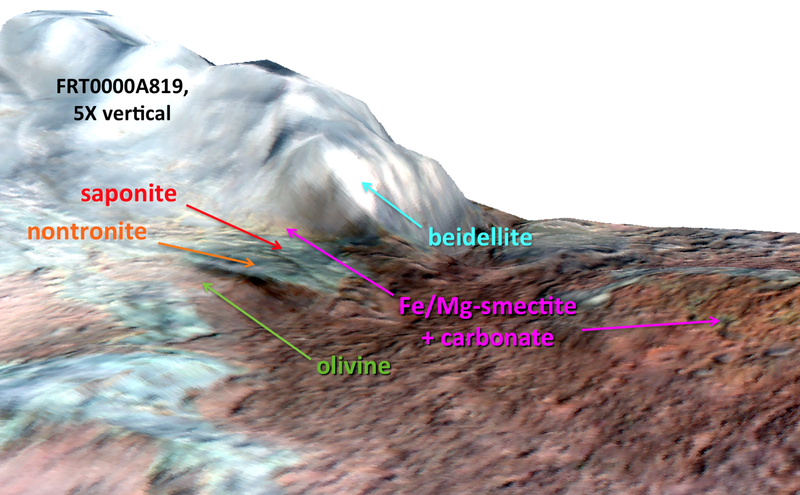 This graph illustrates differences in the spectral properties of the mineral types shown in the 3D CRISM view. Evidence for a past history of wet Mars seen at Lybia Montes from SETI Institute on Vimeo. Rotating 3D view of CRISM image FRT0000A819 showing evidence of an ancient wet Mars at Lybia Montes from SETI Institute on Vimeo. 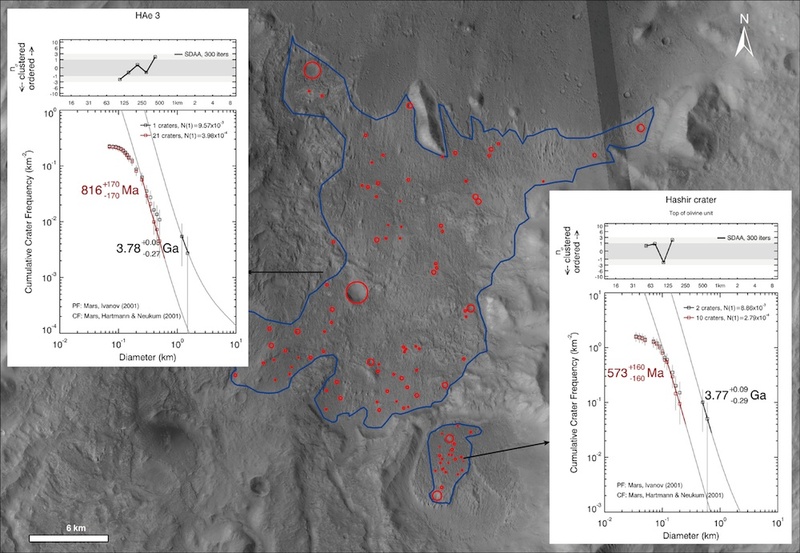 The phyllosilicates and carbonate formed in an aqueous environment on early Mars (cyan) through alteration of an ancient pyroxene-bearing basalt (grey) that forms 1-2 km high mountains in some places. Olivine-bearing rocks (red-brown) covered the region more recently. Image is 5X vertically exaggerated to better illustrate the phyllosilicate-bearing units. Age dating of the geologic units through crater counting was employed to develop a map of the region. Older terrains on Mars have a larger number of craters. Analysis of these geologic units and their ages were coordinated together with the compositional information and surface morphology in order to create a likely stratigraphy for the region. Geologic map of the Libya Montes region created using ages of distinct units and analysis of surface morphology. This is an example from Hashir Crater of how craters are identified (marked in red) and counted and then modeled using crater counting statistics to illustrate age differences of geologic units. The Fe/Mg-smectites and carbonate were likely formed by alteration of the ancient basaltic rocks through interactions with water. 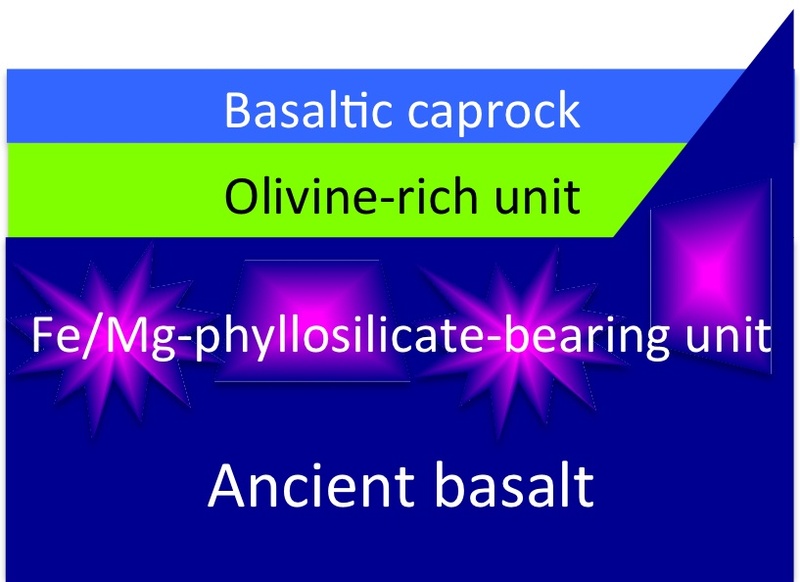 The Fe/Mg-phyllosilicate and carbonate are often associated with olivine in CRISM and HiRISE images because these alteration minerals are observed where the olivine-rich lavas have been eroded away. More recent olivine-rich and pyroxene-bearing lava flow or impact melt deposits filled in the valley regions including Hashir Crater after it formed. Wind erosion of these basaltic caprock units has sufficiently scoured off these materials in some places to provide a window down to the ancient Noachian rocks that were altered under aqueous conditions on early Mars. Stratigraphy cartoon of the rock units in the Libya Montes region determined from this study. 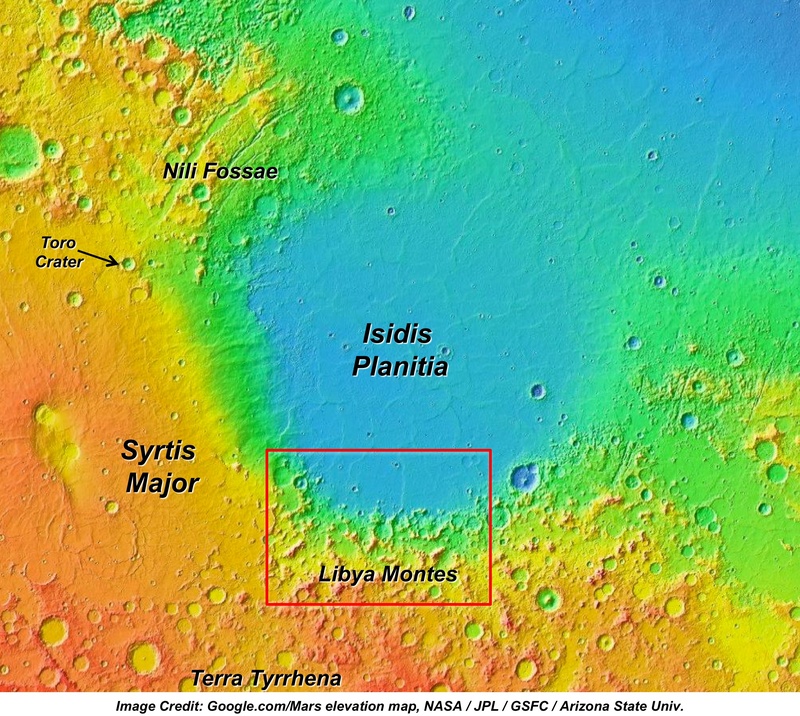 MOLA Map of Isidis Planitia Basin region showing location of Libya Montes study site. Dr. Janice Bishop is a chemist and planetary scientist who explores the planet Mars using spectroscopy. Her investigations of CRISM data of Mars are revealing clays and sulfates in the ancient rocks that provide information about the geochemical environment at the time the minerals formed. Dr. Bishop studies the spectral fingerprints of minerals and rocks in the lab in order to generate a spectral library for identification of these in the Martian data. Her research also involves collecting and studying Mars analog rocks and soils at a variety of locations including volcanic islands, cold deserts, hydrothermal regions, acidic aqueous sites, and meteorites which are the only Martian samples available on Earth to date. Another component of Dr. Bishop’s research is collecting spectra under Mars-like conditions. Spectra of many hydrated minerals change depending on the moisture level in the air and the amount of water molecules adsorbed on the surface or bound in the mineral structure. Understanding the spectral properties of mineral mixtures in the lab is also important for identifying minerals on Mars and Dr. Bishop’s group is preparing and characterizing the spectral properties of several mixture suites.